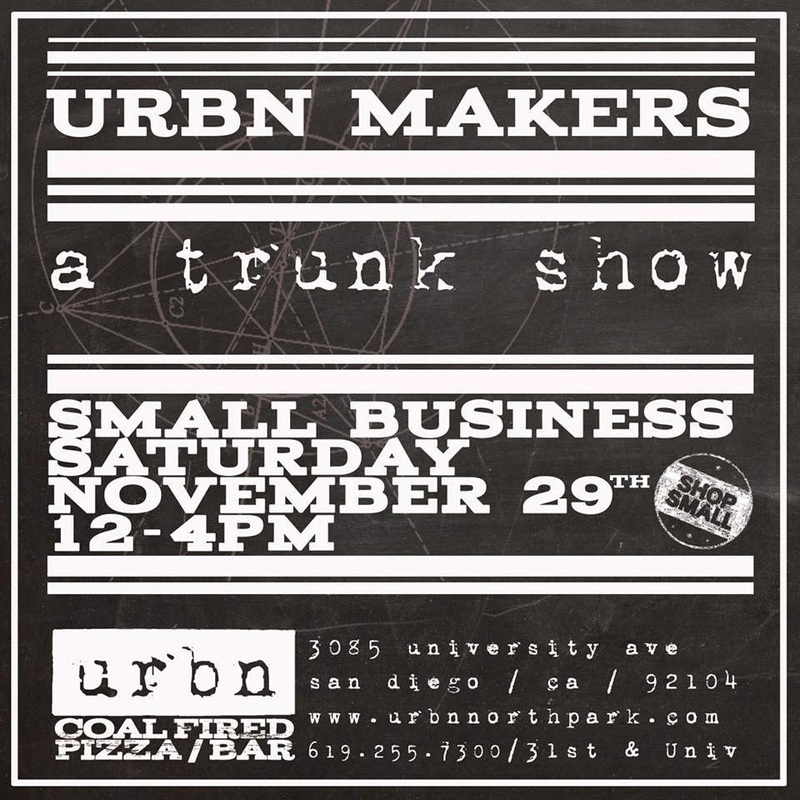 In celebration of the Small Business Saturday movement to support local businesses, URBN Pizza in North Park is hosting URBN Makers on Saturday, November 29, between 12-4pm. URBN Makers will feature a dozen pop-up shops by San Diego creatives and resident North Park artisans, including lifestyle brand West in Motion, up-cycled fashion by Grammatique and jewelry by Flight of Fancy to name a few. The URBN Makers trunk show aims to create a more personal touch to the modern day consumer-driven holiday shopping experience by giving shoppers the chance to enjoy a beer and a slice of URBN’s award-winning pizza while making a start on that holiday gift list, and help support independent retailers in the process. In an initiative that urges consumers to avoid global chain stores in favor of local, independent retailers, Small Business Saturday comes in refreshing contrast to its counterpart, Black Friday. Founded in 2010 by American Express to promote independent businesses, the single day has grown into a powerful movement with more people taking part than ever before. As an added bonus, if you shop at three participating North Park businesses during the event, American Express will credit $30 onto your next months statement. 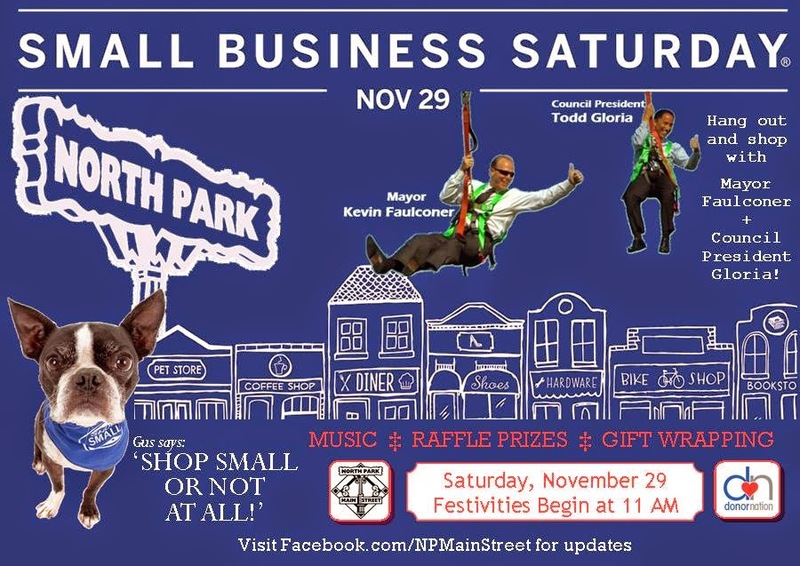 Renowned for embracing the eclectic and the creative, in addition to URBN Pizza, the entire North Park neighborhood will be partaking in the Small Business Saturday event. Council President Todd Gloria and Mayor Kevin Faulconer have planned to take a walk around the neighborhood to show their support and there will be plenty more participating locations in the 92104 zip code. Enjoy a leisurely stroll around the area while you shop at participating North Park businesses, which include Waypoint Public, Aloha Sunday Supply Company, Caffe Calabria, Pigment, Splash Wine Lounge and Bistro, Heavensent Desserts, Cardamom Café and Bakery, Hammond’s Gourmet Ice Cream, Urban Solace and more. URBN Coal Fired Pizza is located at 3085 University Avenue in North Park. For more information, call (619) 255-7300 and visit urbnnorthpark.com.